Every so often, I come across an analytic piece about Egypt that stands out. With thanks to The Arabist (again), who brought this to my inbox: an article by the Middle East Program of the Carnegie Endowment for International Peace about Egypt’s unprecendented instability by the numbers (Michelle Dunne and Scott Williamson). The longitudinal comparative view, the focus on description, rather than speculating too much about the why’s and the what’s next’s, make for a really interesting assessment. It’s bleak, but I haven’t come anything serious that isn’t. The summary: Egypt is far more violent and unstable than it has been in decades. With government repression driving a cycle of political violence, a different approach is needed. Egyptians have suffered through the most intense human rights abuses and terrorism in their recent history in the eight months since the military ousted then president Mohamed Morsi. The extent of this story has been largely obscured from view due to the lack of hard data, but estimates suggest that more than 2,500 Egyptians have been killed, more than 17,000 have been wounded, and more than 16,000 have been arrested in demonstrations and clashes since July 3. Another several hundred have been killed in terrorist attacks. These numbers exceed those seen even in Egypt’s darkest periods since the 1952 military-led revolution that would bring Gamal Abdel Nasser to power. They reflect a use of violence that is unprecedented in Egypt’s modern political history. An Egyptian judge on March 24 sentenced 529 Muslim Brotherhood supporters (147 in custody, the rest at large) to death for the killing of one police officer—in the largest capital punishment conviction in modern Egypt. Though the sentences can still be appealed, they offer a stark illustration of the depths to which Egypt’s political conflict has plunged. Despite Egyptian officials’ statements that the measures they are taking are necessary to stabilize the country, the opposite is true. Egypt is a far more violent and unstable place than it was before July 2013 or indeed has been for decades, as government repression drives an expanding cycle of political violence. And there has been no indication yet that conditions will quiet down anytime soon. It is difficult to figure out how many Egyptians have been killed, injured, or imprisoned during the country’s recent turmoil due to the government’s increased opacity since the military takeover, intimidation of international groups tracking developments, and rifts in the Egyptian human rights community. One organization that has tried to keep track is the Egyptian Center for Economic and Social Rights (ECESR), whose initiative Wiki Thawra has drawn on open source information to compile a statistical database of political violence since the January 25 revolution that led to the overthrow of strongman Hosni Mubarak. While Wiki Thawra’s numbers most likely are not perfect—and in fact the authors hope that others can offer more precise figures—they are the most comprehensive currently available. And they offer a compelling sense of the scale of the violence currently afflicting Egypt. 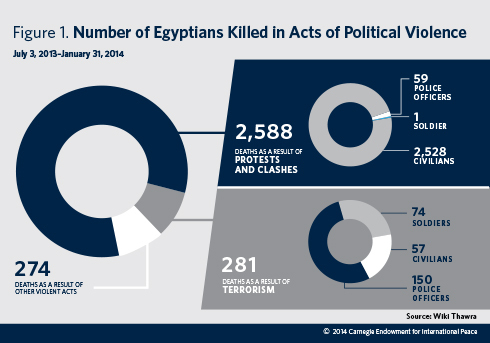 Killed: A total of 3,143 Egyptians are estimated to have been killed in various acts of political violence between July 3, 2013, and January 31, 2014 (see figure 1). Of those deaths, at least 2,528 civilians were killed in political events such as protests and clashes. At least 60 police officers and soldiers were also killed in those incidents. Wounded: More than 17,000 Egyptians are estimated to have beenwounded in more than 1,100 demonstrations and clashes between July 3 and February 28. 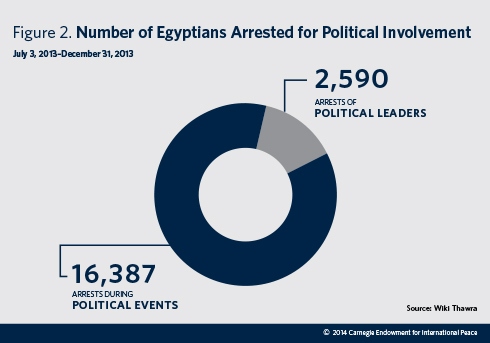 Detained: An estimated 18,977 Egyptians were arrested for reasons related to the country’s political turmoil between July 3 and December 31, including 16,387 detained during political events and another 2,590arrested as political leaders, primarily from the Muslim Brotherhood and other Islamist organizations (see figure 2). These figures are broadly in line with those reported by sources in the government. No more than one-quarter to one-third of these prisoners have been released, according to lawyers at the ECESR. 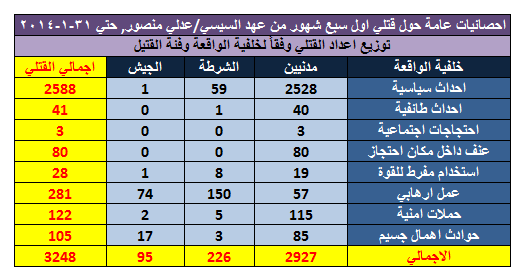 Terrorism: A total of 281 Egyptians are estimated to have been killed in terrorist attacks between July 3 and January 31, including 224 police officers and soldiers and 57 civilians (see figure 1). 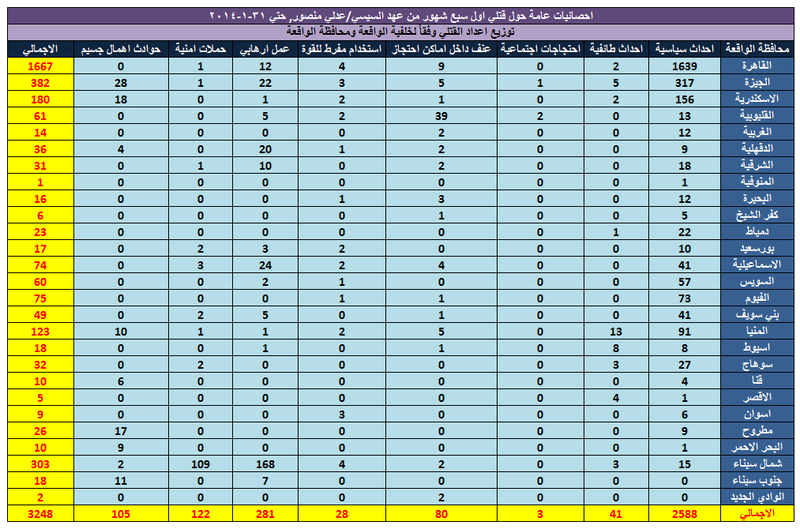 More than 180incidents of terrorism were reported through February 28. 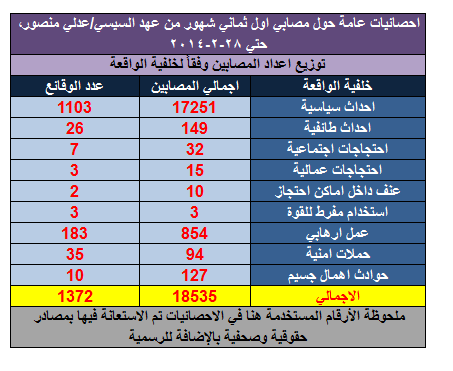 Cumulative figures on militant casualties do not seem to be available, but in February 2014 alone the military’s spokesman announced the killings of at least 56 militants in the Sinai Peninsula. How does the scale of this violence compare to previous periods of repression in Egypt since 1952? As post-coup instability accelerated following Morsi’s ouster, commentators described the crackdown on the Muslim Brotherhood as the most intense since the 1950s and also asked if Egypt would witness a return of theterrorist violence of the 1990s. But if the above numbers accurately capture the scope of the current troubles, it seems clear that Egypt has already surpassed both of these deadly landmarks. Between 1992 and 1998, the Mubarak regime faced a small but deadly Islamist militant insurgency (not the Brotherhood per se) that targeted government officials, tourists, liberal intellectuals, and Christians. Credible estimates suggest that approximately 1,500 people were killed over seven years. The years 1993 through 1995 were the deadliest, with near-daily attacks that included assassinations of government officials and police officers, shootings of tourists, and small bombings. According to figures compiled by the Ibn Khaldun Center, a total of 332 people were killed in 1993 (120 police, 111 extremists, 101 civilians), 304 were killed in 1994 (93 police, 159 extremists, 52 civilians), and 415 were killed in 1995 (108 police, 217 extremists, 90 civilians). Egypt also experienced a spate of terrorism in the 2000s, of which the highest-profile attacks targeted tourist hotels in the Sinai and killed some 150 people between 2004 and 2006. In the first seven months following Morsi’s ouster, the pace of terrorism-related deaths in Egypt surpassed the worst years of the 1990s. As mentioned above, 281 Egyptians are estimated to have been killed in terrorist attacks between July 3 and January 31—including 224 police and military personnel and 57 civilians. That figure does not include militants, who are accounted for in the figures from the 1990s. The locations of the current terrorist attacks are also significant. Such attacks were happening in Egypt before July 2013; according to Wiki Thawra, there were some28 victims during Morsi’s year in office (July 2012–June 2013), all or most in the Sinai. But between July and January, 106 of the 281 deaths from terrorism took place in the Egyptian mainland and across twelve different provinces. And the pace of attacks shows no sign of slowing down. A brief perusal of Ahram Online articles in February 2014—hardly a comprehensive summary of attacks—reveals that 23 security personnel were reportedly killed in attacks in that month alone, all of them outside Sinai. Violence against police and military officers now seems to be an evolving mix of larger operations planned and executed by Sinai-based groups and smallervengeance attacks carried out against local officials, with specific local motivations. Regarding the larger attacks, militants have shown that they are capable of inflicting far more damage should they choose to do so. To date, most attacks have involved targeted killings of police officers, soldiers, security officers, and a handful of high-level government officials and have not aimed at inflicting mass casualties. There have been worrisome incidents that point to increasing sophistication, however, including several bombings of security buildings and the use of a surface-to-air missile to bring down a military helicopter. Targets might be expanding, as indicated by the February 16 suicide bombing of a tourist bus in the Sinai that killed several South Koreans. Militants have also shown they are capable of ramping up operations to mark certain occasions; the third anniversary of the January 2011 revolution brought a spate of deadly attacks to the Cairo area. Late president Gamal Abdel Nasser’s harsh crackdown on the Muslim Brotherhood in the 1950s had been the worst period of repression in Egypt’s modern history, but it seems to have been overtaken by recent events as well. Following an assassination attempt on Nasser in October 1954, the government arrested thousands of Brotherhood members. Within the first two days of the crackdown, 700 of the organization’s leaders had been detained, and by the end of November the number had risen to 1,000. On December 9, six Brotherhood leaderswere executed by hanging, despite angry protests in the Arab world and shock in Egypt. Nasser soon expanded the list of targets to encompass his liberal and leftist opponents, and through 1955 as many as 20,000 Egyptians were jailed. Many were tortured and placed in concentration camps, which had been built to accommodate the expanding prison population. The repression persisted throughout much of Nasser’s rule; six additional Brotherhood leaders were executed in 1966, and Nasser’s opponents remained in prison for years. Egyptians also look back to 1981 as a time of intense political repression. During September of that year, late president Anwar Sadat jailed more than 1,500 dissidents (mostly Islamists, but also prominent leftists, Nasserists, and liberals), events which are considered part of the lead-up to his assassination in October. But the current crackdown is much larger. Like Nasser, the post-Morsi government has depended heavily on detentions to crush its opposition. As many as 3,000 Egyptians were arrested shortly after Morsi’s ouster on July 3, and by the end of 2013, the total estimated by Wiki Thawra had already exceeded 18,000, including Brotherhood leaders and thousands of Egyptians picked up at protests and demonstrations. Prisons are reportedly overflowing, and allegations of torture are widespread. The crackdown has not been limited to Islamists; prominent revolutionaries from the January 25 revolution have also been thrown in jail. Brotherhood leaders including Morsi are currently on trial for charges that carry the death penalty, and more than 500 supporters of the former president were sentenced to death on March 24, 2014, in a three-day trial. The sentences can still be appealed and overturned. It remains to be seen whether the current authorities will follow in Nasser’s footsteps and use the courts to have their political opponents executed. And it has not just been Rabaa. Since July there have been at least 36 incidents in which ten or more Egyptians were killed in political protests and clashes. Egypt’s rulers have already earned two dubious distinctions in less than a year: since 1952, no Egyptian regime has been more repressive, and no regime in more than a generation has confronted a more intense terrorism challenge. Where the current authorities have not yet caught up to their predecessors in the Nasser and Mubarak years is in duration. Nasser (and his successors) left thousands of Egyptians languishing in jail for years, and the insurgency of the 1990s continued for at least half a decade. But in the end Nasser did not eradicate the Brotherhood, a movement present in Egyptian society and public life since 1928. And while the 1990s insurgency was eventually defeated, the campaign against it brought a heavylegacy of authoritarian laws that sowed the seeds of unrest. Support for the Salafi groups involved in the insurgency later rebounded, too. The current government’s actions seem to be taking the country down a similarly long path. Egyptian government officials continue to justify the crackdown as needed to quell the terrorist threat, brushing aside the fact that the threat was a fraction of its present size before the crackdown began in the summer of 2013. Some members of the international community—Saudi Arabia, the UAE, Israel, and Russia notably—have fully embraced the Egyptian government’s narrative. Others—the United States and many, if not all, EU member states—are conflicted. U.S. and European officials undoubtedly would like to see human rights abuses and terrorism end in Egypt, and they have been willing so far to give the government some time and to keep their criticisms muted—in the statement issued at the United Nations Human Rights Council in March 2014 and in the U.S. State Department’shuman rights report, for example. But they are nagged by doubts that things are not going well in Egypt. Egypt is now preparing to pass yet another landmark in the political road map put into place upon Morsi’s removal—the election of a new president, most likely the very Defense Minister Abdel Fattah el-Sisi who removed him. As the vote approaches, the question to ask is not so much whether a broad campaign of political repression and human rights abuses might, in theory, quiet Egypt down, but whether it actually is quieting Egypt down. The evidence to date shows that it is not. A different course is needed. Absent an inclusive economic, political, and rights strategy that replaces brutal repression and helps Egyptians become far more invested in the government’s success, a continuation of the cycle of protest, repression, terrorism, and revenge is a more likely outcome than stability. What’s there to add to this? Maybe some JJ Cale? This entry was posted in society and tagged Carnegie Endowment for International Peace, Egypt, JJ Cale, Michelle Dunne, political analysis. Bookmark the permalink.